If there is one thing that will get me out of bed, it’s food. Like most 20-somethings, the first thing I do in the morning is check to see whats on Groupon and whats on Twitter. What did I spy with my little eye this AM? A tweet from @BigDFoodTrucks letting the world know that@GandolfosDallas was going to be setting up on Dragon Street today. Being the good citizen I am, I followed@BigDFoodTrucks advice. I woke up and headed over to lower Oak Lawn. I must admit, I was like a rabid rat at the thought of a NY style bagel in my mouth…in Dallas. Could it be true? Were the pearly gates of heaven going to open up right in a grease stained parking lot? 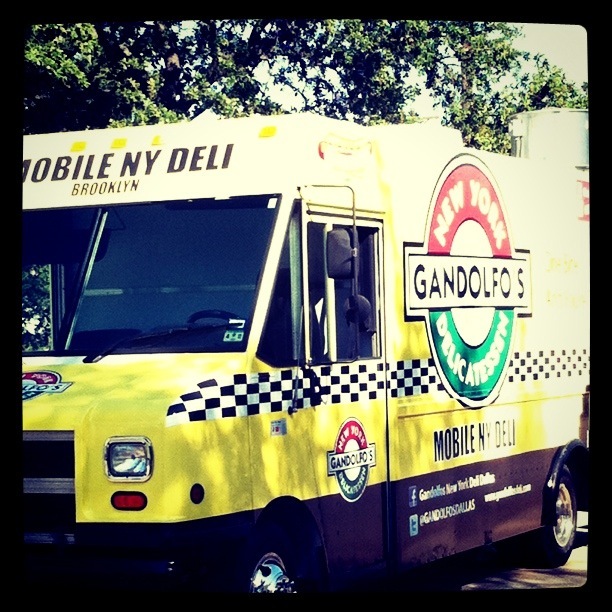 Now, there are so many food trucks popping up in our glorious city but@GandolfosDallas was at the top of my list. I’m about as far off from a pastrami, sausage, bacon or any other mystery meat product eater as the come but I have been dying to try@GandolfosDallas. Is it the fact that they have some sort of connection to the city where the streets are paved with gold? Perhaps. Is it the fact that they make food..in a truck? Very likely. Maybe it’s the idea that I see either them tweeting or people tweeting about them constantly. I’m a sucker for a food-mobile that is on their social media game. When I pulled onto Dragon street my heart started beating in anticipation just like it did when I saw Aaron Carter in concert, but thats a story for another day. I passed a little yellow truck and my eye directly went to “NATHAN’S HOT DOGS,” I kept driving. Actually, I floored it. I’m scared of four things in this life-spiders, sharks, snakes..and Nathan’s Hot dogs. My first and last experience with these repulsive meat sticks happened at Miami airport where I decided to have one for breakfast since apparently in a Cuban-driven city nothing else is open at 7am. Nothing like dry heaving in a public restroom that hadn’t been cleaned in 3 years, give or take a day. Ladies and gentleman of the jury, I rest my case. Realizing that it was actually@GandolfosDallas that I had seen I started to second guess why I got out of bed after all. 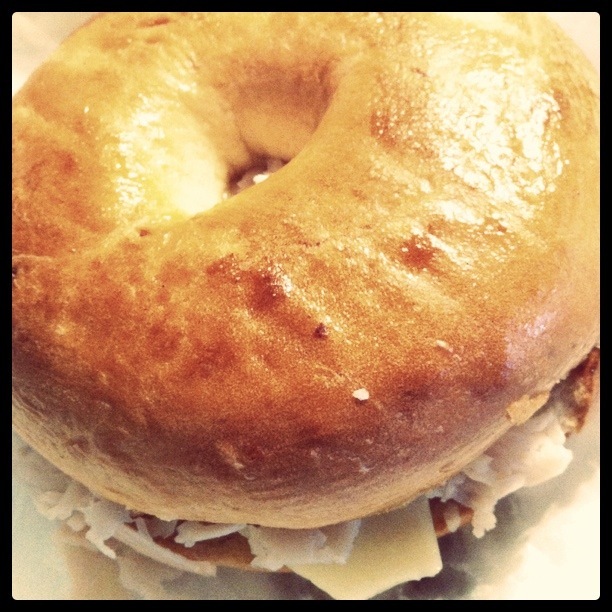 I can’t exactly say @GandolfosDallas carries NY style bagels but they are pretty damn close. There is just something about a bagel, or my personal favorite-the flagel, made by a New York City Jew that makes all things right in the world. Although at first glance, the Chaz seems like nothing special, looks can be deceiving. This thing is incredible! As much as I’m not a mystery meat girl, I’m not a breakfast person either. I would much rather have chips and guac at 8am than anything else but@GandolfosDallas may have just changed my mind. Oh great, now I will be the crazy lady camped out in various parking lots around Dallas with a sign stating “Will work for bagel.” I’ll be dammed if I don’t have a delicious breakfast to show for it though!